ESV’s electrical apprentice safety campaign was launched in response to a frightening rise in incidents and fatalities of young electrical workers. Since 2015, ESV’s installation safety team investigated five electrical worker fatalities, three were apprentices and four were under 25 years of age. In January 2018, a 29-year-old licensed electrical worker died whilst working near live parts. In late June 2018, ESV commenced the roll out of our Apprentice LOTO kit program for its second year. 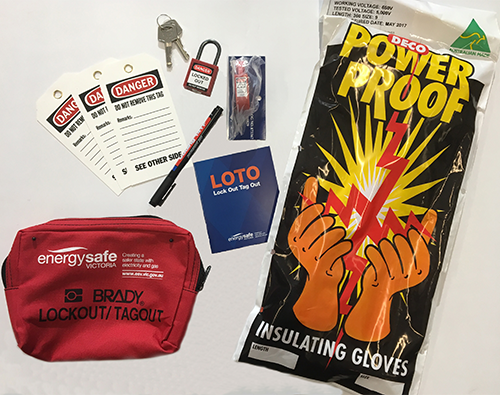 In 2017, the LOTO kit apprentice safety program was so successful and the response from industry was overwhelmingly in favour of the program that ESV committed to another two years of the program. This extends the program to a third and final year for first year apprentices in 2019. This program is an important initiative to help apprentices understand the importance of following safe work practices and using appropriate safety equipment on the job. ESV recommends the use of low voltage insulating (LV) gloves on the job where there is a risk of accidental contact with live parts, such as when testing or fault finding, the application of lock out devices and using a danger tag to notify others. As our Compliance team visit each RTO, they will together be handing out LOTO kits directly to eligible first year apprentices. Apprentices will be asked to watch our safety videos (refer below) and sign for their LOTO kit. We also hope they will sign up to email alerts about important industry and regulatory changes. By doing so they will get an understanding of how industry improvements occur and the changing regulatory environment; an important aspect of their future lives as licensed electrical workers. Download the 2018 LOTO kit registration form in MS Word HERE. ESV’s Electrical Installations Safety (EIS) team has developed a presentation on electrical safety for first year apprentices and another for supervisors of young electrical workers. Or check them out on our YouTube channel – Apprentices and Supervisor’s. From 1 January 2019, candidates attempting the Safe Working Practice (SWP) and Restricted Licence Class 2 assessments will be required to use gloves during their assessment. This requirement includes both low voltage insulating (LV) gloves compliant with AS2225, and fire resistant outer gloves for mechanical protection. The use of gloves has already been a requirement of the Restricted Licence Class 1 Fault Finding and Switchgear Workers Licence assessments for some time. Candidates must supply their own gloves for the assessment. Gloves are to be used when the risk of accidental contact with live parts is possible, including when live terminals are exposed for testing. Once isolation has been proven, and the circuit locked out and tagged out (LOTO), the gloves may be removed. There is no penalty if the candidate chooses to leave their gloves on for the entirety of the assessment. For more information about the use of gloves in assessments, chat to your RTO or contact ESV on the email and phone numbers below. All electrical workers, including apprentices, can contact ESV to find out more about electrical safety and safe work practices. For electrical technical questions, call (03) 9203 9700 and select option 2, or email electricalinstallationenquiries@energysafe.vic.gov.au. To report an immediate safety concern or electrical incident call 1800 000 922. For other concerns or general queries, email info@energysafe.vic.gov.au.